This post was written by peterjmurray on September 28th, 2018 9:35 am Comments Off on BRILLIANT AT BAILY! Kath and I have visited this school a good few times during my author career, but nothing could have prepared us for the fantastic response we got during our recent visit. 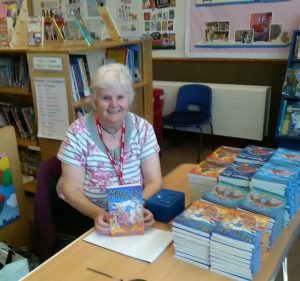 Our lovely librarian friend, Ms Mumford, accepted our offer to introduce the final instalment in the Mokee Joe series – Mokee Joe: Scourge of the Emirates – set in the glamorous location of Dubai. Come the day of the visit, I felt a little bit nervous of only having just over an hour for my presentation, which normally lasts for just under two hours! The big audience of Years 4,5 and 6 sat before me in stiff silence as I launched into a ‘potted’ coverage of how I became an author followed by speedy snippets of the first five books. By the time I reached the intro of the final book, the audience were totally relaxed, rocking with laughter at my non-stop jokes and funny anecdotes, but at the same time gripped with descriptions of the ensuing battles between the hero, Hudson Brown, and his terrifying enemy, Mokee Joe. It was a fabulous hour of fun and it passed only too quickly! Once again, the Francis Baily audience did themselves proud…totally engaged, interactive when required, and to use the old cliché – ‘you couldn’t hear a pin drop’ during my readings. The calm before the storm in the school library! All very well, but how would the book signing go the next day? Ms Mumford kindly allowed us to use her fabulously cosy library, and she and Kath set up the signing area with lots of Mokee Joe books for the pupils to browse over. …What followed had to be seen to be believed! So many boys and girls eager to get their hands on the books and ‘devour’ them at the earliest opportunity! The excitement as they looked over the books, ran their hands over the richly-embossed covers, and enjoyed the smell of the newly printed pages… Who says that children are not excited by books anymore! The signing went on for the whole of the afternoon and we still hadn’t finished by the close of school. In fact we returned the next day to finish off with a Year 5 class who unselfishly volunteered to curtail their excitement for a further 24 hours. All in all a wonderful experience and the reason I am so keen to keep on writing and working with such an enthusiastic and enjoyable age group. The children at Francis Bailey proved great friends, polite and helpful without exception. Thank you to them (and the staff) for everything. This post was written by peterjmurray on September 23rd, 2018 11:09 am Comments Off on BACK WITH A BANG! I can’t remember starting a new academic year with such an amazing week as last week. Three ‘cracking’ schools in my native South Yorkshire – Dronfield Stonelow Juniors, Thurcroft Junior Academy and Kiveton Park Meadows Juniors provided the perfect start-back after the long hot summer holidays. Pete with Mitchell – a life-long fan, at Kiveton Park Meadows. I have visited each of these schools a good few times during my author career and have many fans spread over several generations within these lovely school communities. 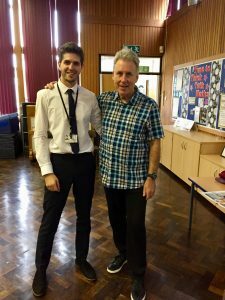 As one of the young teachers said to me at Kiveton Park Meadows, ‘I’ve grown up with your Mokee Joe books and can’t believe you’re here today to present the final book in the series.’ (Mokee Joe: Scourge of the Emirates). Needless to say I signed a book for ‘young Mitchell’ the very next day! I want to congratulate the head teachers and staff on the warm ambient nature of each of their schools as well as managing to create a fabulous reading culture throughout every year group. Will we ever forget the length of those queues of children desperate to get their hands on our books and ‘devour’ them at their earliest opportunity! As one of the teachers said to us. ‘I can’t believe how many children are already sitting in the playground, shivering in the cold, but totally absorbed in their reading.’ I quickly pointed out to her that they may well have been shivering with fright rather than cold! Thanks again to everyone for making us so welcome…enjoy your books and have a great run-up to Christmas…but don’t forget that Halloween is just around the corner!